It is the time of the year when you have to apply a new finish on the cabinet. Of course, we have been tempted numerous times to just paint over the old finish. However, that is a terribly awful idea. Gloss, dirt, as well as other contaminants on the old surface will prevent the new paint from sticking. Even if you manage to paint over, the result will not be durable and satisfying. Dust particles make the impossibility to achieve a smooth surface. If you want to re-paint cabinets or other woodworks, you have to properly remove the old finish. You need to have it buffed up, roughed up, or sanded. Usually, the choices for surface preparation come down to two options: deglossing or sanding. 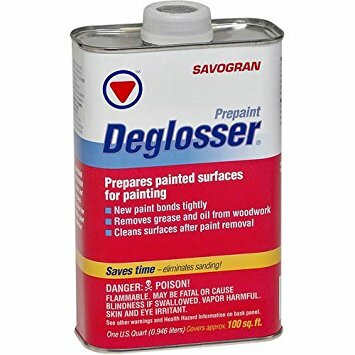 Deglossing is done by using a deglosser, also known as liquid sandpaper. Meanwhile, sanding may use a sandpaper or an orbital sander. So, should you degloss or sand? There are several factors that you may need to consider. In order to choose between deglossing and sanding, there are several factors that you may need to ask yourself. The first is health concerns. Are you fine with harsh chemicals? Can you deal with dust particles? The second is the conditions of your project. How large is the surface that you will have to handle? Does the old paint contain lead? Finally, the third thing that you may need to consider is how much time and budget that you have for the project. Those are very important points because forgetting a detail may lead to problems or issues. You have to be very cautious about health concerns. Exposure to lead, breathing in dust, and inhaling volatile chemicals are harmful. If the old finish contains lead, you should seek a professional help to remove it. Also, if you are going to re-paint an old desk that has been handed down for multiple generations, you have to be careful. Just apply the deglosser on a small area before the entire desk. Or, if you are using a sandpaper or an orbital sander, avoid giving too much pressure. If you have very limited time, a deglosser is a more sensible solution. Deglossing is relatively simple and fast. It still takes some time, but not as long as sanding. You just need to apply the deglosser to a soft cloth or sponge. Then, the process is mostly about wiping the whole surface. Afterwards, wait for about thirty minutes and let the liquid does the magic. Using a liquid sander is also a convenient way to take care of nooks and crannies which are hard to reach by a sandpaper. Thus, for a piece of furniture that has lots of etched details, a deglosser will save you a lot of time and give the best results. On the other hand, sanding takes considerable time and effort. Even if you use the electrically driven orbital sander, you may still need hours to sand a door from top to bottom. 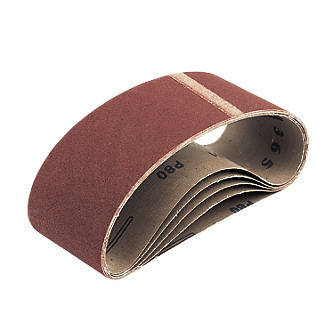 Using a sandpaper is even more tiring, thus more suitable only for small-scale projects. Sanding a particularly large cupboard with sandpapers may take the whole day or even more. Nevertheless, sandpapers are utterly cheap. If you have a very limited budget, sandpapers are good. Even so, spending a few more bucks to get a small bottle of deglosser will not set you back too much, considering that you can use the bottle for several more times later. It will go a long way down the road. If you have some extra money to spend, an orbital sander can be a good addition to your toolkit, especially if you use the device quite often. An orbital sander is a must-have device for craftsmanship. If you don’t mind working with harsh chemicals, you can use a deglosser. Otherwise, if you disdain harsh and volatile chemicals, you may want to stay away from it. These chemicals are responsible for removing the glossy surface from any furniture surface. There are many different deglosser products on the market, and they use different chemicals, such as isopropanol, naphtha, toluene, ethyl acetate, and mineral spirits. When working with such substances, you must wear a breathing protection, goggles for eye protection, and chemical-resistant gloves. Also, make sure that the room has enough air circulation to allow the volatile gases to go away. Or you can opt for the low VOC deglossers to reduce the amount of fumes that could be inhaled. Sanding can be a more suitable option if you hate harsh, volatile chemicals. But it is not without health issues. Typically, sanding produces dust. Thus, you should wear breathing and eye protection equipment, too. Be careful when sanding not to hurt your own fingers. Different types of finishes are not created equal. Expensive ones may offer better protection, but they may also be difficult to remove. Usually expensive finishes with UV coatings, precatalyzed lacquers, and oil-based polyurethanes would resist deglossers. Thus, it is next to impossible to remove such surface without sanding. 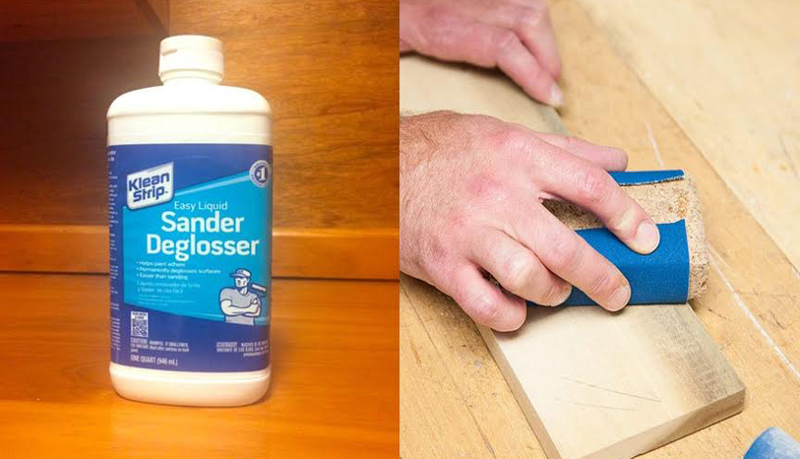 If you don’t see any result with a deglosser, try sanding. In addition, a deglosser also cannot repair a bad surface. If the old paint is irregular, rough, scratched, or pitted, a deglosser will not smooth it. A previously rough surface will remain rough after getting deglossed. Your best bet to repair a bad surface is sanding, using either a sandpaper or an electric sander. With the abrasive power, smoothing can be done easily. Make sure first whether the old finish contains lead, because if it does, you need a professional help to remove it. A deglosser is a great option if you want to be all quick and effective, considering that applying a deglosser is very simple. A deglosser is also great for taking care of the intricate details of the furniture. However, a deglosser contains harsh chemicals, and can neither remove some types of finishes nor repair a bad surface. If you disdain harsh chemicals or need to remove a bad or deglosser-resistant finish, sanding is the solution.